New year card design contest! Home › Forums › General discussions › New year card design contest! This topic contains 12 replies, has 11 voices, and was last updated by Lucas Young 2 years, 3 months ago. Welcome to a very special card design contest! 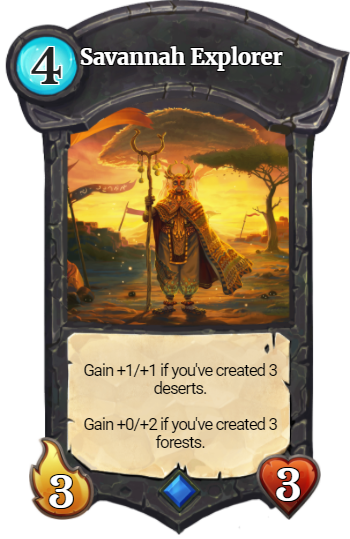 Our contest are a chance for Faeria fans to flex their design muscles and win some sweet in game prizes while doing it! All submissions are carefully judged by our staff and the top 3 cards win a prize. It’s been an awesome year for Faeria with new content, cards, and players at every turn. 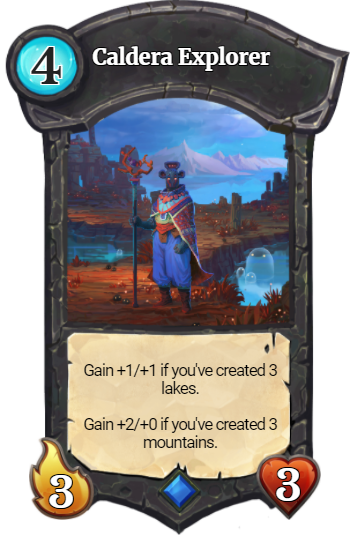 As the new year is about to begin, it’s time for the characters of Faeria to reinvent themselves with their own new years resolutions. They aren’t very creative on their own, however, so they need your help! 12/31/2016 Theme: New years balance resolutions! We have challenged designers on a litany of creative skills, but never have we issued a content that was primarily about card balance. Until now, that is. 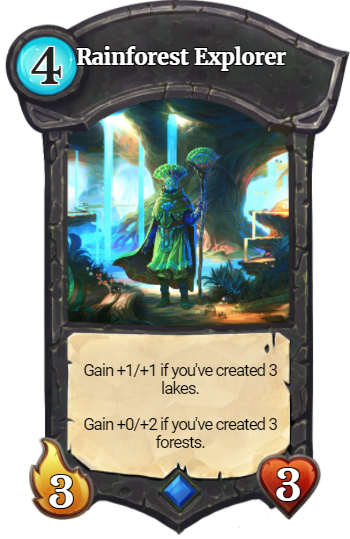 We want you to take a Faeria card in need of some changes… and change it! It’s going to be a new year, so what is more appropriate than setting your favorite (or even least favorite) Faeria card on the path to self-improvement. 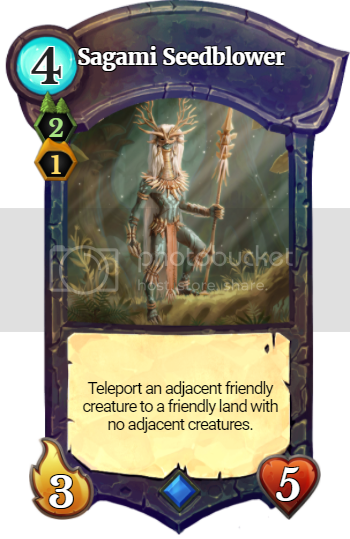 Think about the Faeria cards that hardly see competitive play. What would you change to make them more viable? Would you re-invent them completely, or perhaps adjust their numerical stat line? Or what about the cards that are TOO powerful? Now is the perfect opportunity to turn that ladder salt into new years productivity! 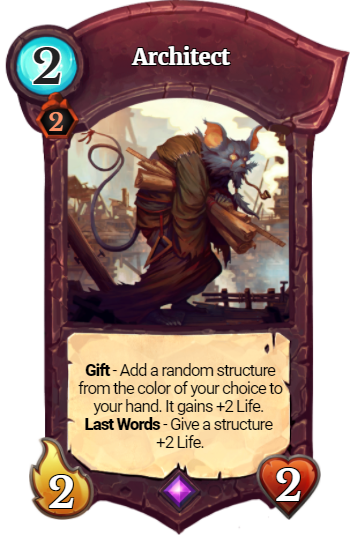 This contest will be primarily about balance changes, so be sure to provide at least a brief explanation as to why your changes will make the card better. 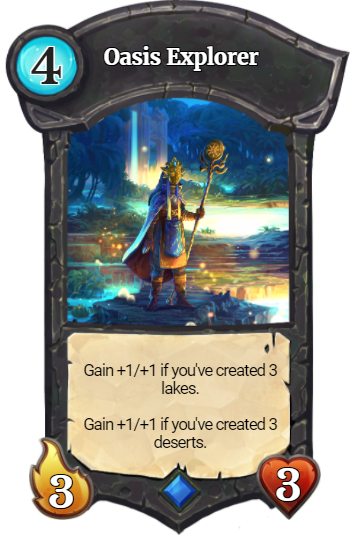 Design your card using the Faeria card creator located at http://ninja.digital/makefaeria/, Photoshop, paint or whatever other image software you might have. You can even illustrate your card and send us a photo of it. The important thing is we can see your card and read what it does. If none of the above work for you, try https://pixlr.com/editor/. 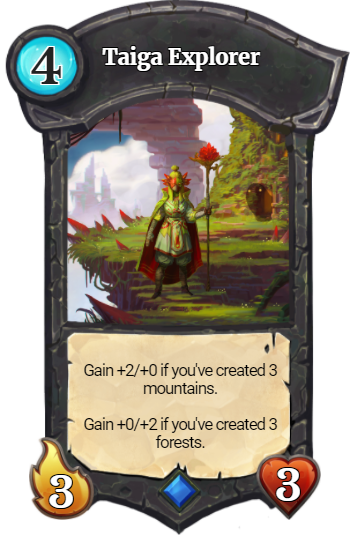 Post your card as a reply to the forum topic and as an email to social@playfaeria.com within the submission window time. Please include your in-game name. Follow us on Twitter and Facebook. It’s not obligatory but we appreciate it. The best card will be revealed, and the winner will be awarded their in-game prize(s). That’s it! Good luck aspiring designers! Well, i think i will not be the only one who think a serious resolution is to balance this card!! The Bubble is a bit small so i put the arwork too. Happy New year ! This reply was modified 2 years, 3 months ago by Maihem. One of the crazy mobility cards from the last set was nerfed into the ground, but Sagami Huntmaster still escapes justice. In my opinion, Green’s lack of mobility was a defining characteristic which had to be overcome with different strategies, some of them involving other colours. A very impactful second Jump card, Feral Kodama hurt this image, but Sagami Huntmaster utterly destroyed it, with the strongest mobility effect in the game, able to get a Jump creature from anywhere on the map and place it virtually anywhere else on the map. It’s pretty hard to play around Kodama+Huntmaster and it’s strong enough to easily make the cut in any Green deck. Mono-Green is very vulnerable to control cards and introducing a few generally OP auto-include cards is one way to mitigate that, but imo it’s not the best way, especially when one of the cards goes so strongly against the grain that defines that colour, so I’ve chosen to leave that problem hanging and rework Sagami Huntmaster into a balanced card. 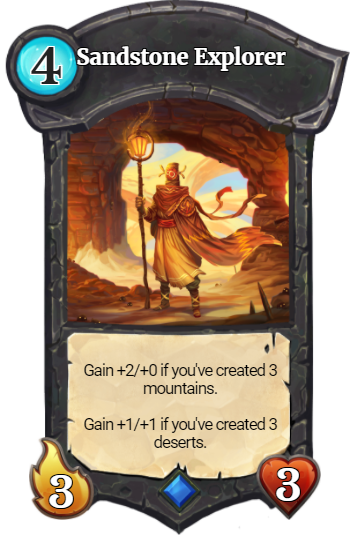 My card edit attempts to address the Green identity crisis by adding a Desert to the card cost, as Yellow is the colour known for mobility. 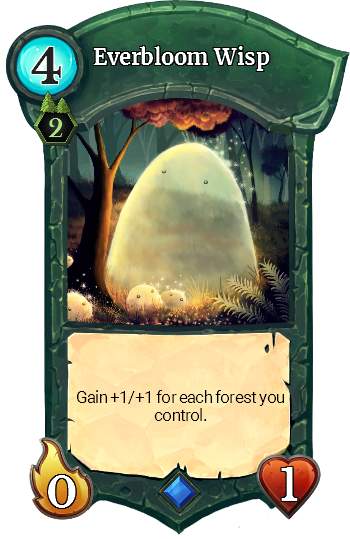 The major nerf, however, is in the card text, which I changed to be very situational, but also very thematic, where the player in many cases is trying to create a lonely Desert and then spirit a friendly creature to journey across it, in the same way that plants can colonise new lands using disturbance zones. This doesn’t allow a creature to be teleported quite as deeply as with the present Sagami Huntmaster and also opens a very reasonable opportunity to play around the effect. It also adds some decision making in having the ability to move a creature and play the new Huntmaster in that place, forgoing a space of movement after the teleport, which might be advantageous for blocking, collecting or developing defensively or might be necessary in order to free up a forest. I changed the stat line to something I believe to be consistent with a card which has a highly situational effect and a 3 land, 4 Faeria cost, increasing its Attack in order to make it a more capable defender, but importantly increasing its Life total to benefit from Green synergy cards, since though it may dabble in the Yellow arts, it’s still primarily a Green creature. I played around with some stronger effects and other options such as exhausting the teleported creature, but I think this route offers the most enjoyable and interesting gameplay. Thought that high mobility (teleportation) didn’t fit Forest, so I basically just switched out the ability of the Sagami Huntmaster without having to touch any stats on it. Mechanically, it functions as a pseudo-removal of sorts, but it isn’t costed as a removal as the creature is still capable of attacking and being moved by other cards. Thematically, a Huntmaster locking down potential prey sounds pretty lore friendly. The current version of Everbloom Wisp needs to be on the board early, then survive several turns before getting decent stats. This new version makes it useful late in the match too, as it now gets buffs from forests that were created earlier too. I’ve mentioned this idea before but it seems applicible: Rework the Explorer Cards to be more playable. Right now duo-colored decks generally don’t perform as well as mono-colored decks and no one plays the explorers. By changing all of their stat bonuses to function more like Gabrian Archon instead of a Gift you don’t get so penalized for playing them early, and their eventual bonuses would influence the order you create your lands in an interesting way. Krog has long been completely worthless… His stat line, cost, and combat effect really just make him a worse version of Magnus. Thus, I thought I would give him an update that falls more in line with the recent changes. 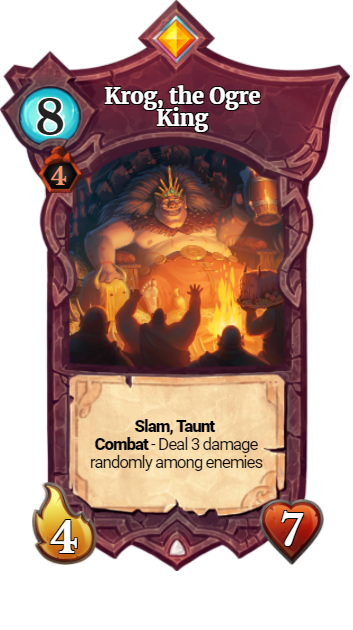 I gave him slam because why wouldn’t an ogre king have slam. I gave him taunt because why wouldn’t a king demand your attention. Lastly, I gave him a combat ability that deals damage, which fits really well with red’s current meta decks. The deal 3 damage isn’t that onerous and his 4/7 stat line is meant to make him a bit sticky but not wildly overpowered. To balance out some of his powerful abilities and stats I gave him a pretty high cost of 8 faeria and a 4 mountain requirement. I’m not too sure that all of this adds up to a perfect balance, but this version of Krog would at least be playable. Happy new year and long live the King! Ok after I made the above post I decided that my new Krog was to similar to other red cards and not original enough. To that end, I made some tweaks to the card and gave it a different combat effect. Please disregard the above card and judge the one below (for some reason I can’t edit my first post). Basically, I gave Krog a combat effect that affects the cost of cards in your opponents hand. 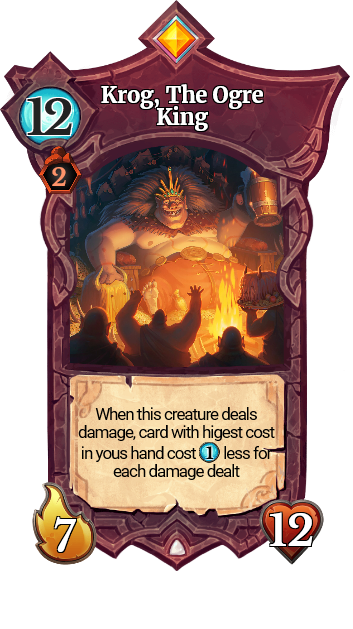 I figured if doing an ogre dance or singing a blood song affects the cost of cards in your hands, why couldn’t a high ogre pray to the gods to increase cost of your opponents hands. I gave him a 9 faeria cost and 4 mountain requirement to balance out his strong abilities. He is still an ogre king so has a decent 4/7 stat line, the slam effect, and taunt. These changes better fit the recent card updates and would fit well into the current red meta decks. I think with these changes he would be really useful and could actually see some play. This reply was modified 2 years, 3 months ago by Frymn810. Hello friends. 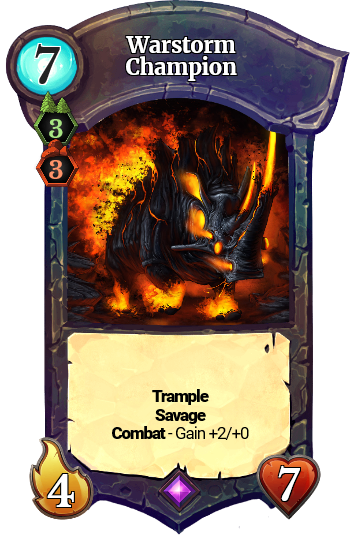 I want to share with you my idea to rework 3 cards – “Krog, the Ogre King”, “Ignus, the First Flame”, and “Warstorm Champion”. Krog have really low attack compared to his cost. I think, that changeing his attack from 2 to 7 would make him more playable. Also, as you can see, I have changed his text, so if you buff his attack to 9, he is going to discount cards for 9, and “random card” was replaced by “card with higest cost”, with means, that you are going to always get optimal value (if you have few higest cost cards in your hand (for example Magnus and Garudan), target is going to be chosen randomly. Right now, Ignus is just to random. He can destroy creature you want, but at the same time he may just deal 4 damage stright into face. I think, that giving him ability to throw mini meteors would be quite funny, and make him usefull in control decks. I just hate cards with “random” in theires text. Thats why I decided to radesing this card. This angry rhino would literally trample over your enemies. Unfortunately, CGHub was closed, so I couldn’t find author of artwork. This reply was modified 2 years, 3 months ago by Marcin. My version of Orosei is still a 10 faeria 2 lakes 6/6 Flying Charge 2, but the gift is “Shuffle a copy of each card in your hand into your deck”. I’ve chosen Orosei because I think that’s currently a pretty boring card, it basically only offers you to build one deck archetype, and decks has to revolve around him. Besides, I was happy with Unbound Evolution being reworked, I think it’s time that Orosei follows. There’s currently no possibility to “add” anything to your deck based on card ability, and I kinda miss it, I think it’s a very fun mechanic. 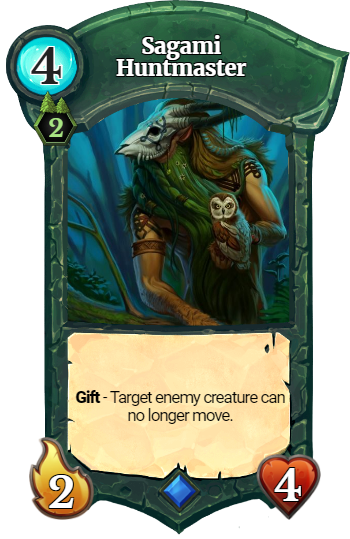 Now about pure gameplay and balance, I think the gift offers some interesting possibilities, but since the effect is delayed and potentially inconsistent, it cannot lead to OP combos. – adding value : note that players would then have the choice between playing higher tempo or counterplay value cards or playing Orosei to grant themselves a better lategame, thus taking the risk to slightly fall behind. About the current meta : I think this rework would have a positive impact on the meta. It has nothing to do with aggro (aggro deck aren’t blue to begin with ^^), most midrange decks wouldn’t run it. It doesn’t make Reaver decks stronger I think (which is good since it’s already powerful), but it would help fun decks like Egg of Wonders or Day of Dragons, or some control decks. The only interaction that bothers me is Forbidden library, since it’s an already powerful card, and it looks like this rework may be good with it. This reply was modified 2 years, 3 months ago by Zgounda. Hello, new user here, and somehow I knew most submissions would be about Krog, lol. Well my entry is another under-used Legendary, namely Sharra the Dragonslayer. The problem with this card is that the situations where she is useless are generally far more likely to occur than the situations where she is decent, and there are very few situations where she is absolutely excellent. Her hefty cost makes her unsuitable as a tech. So in my redesign I tried to keep the original base stats (cost/atk/life) and stick to the flavor, while making her a worthwhile inclusion in at least some decks. Flashstrike: When attacking, this creature deals combat damage before the defending creature. 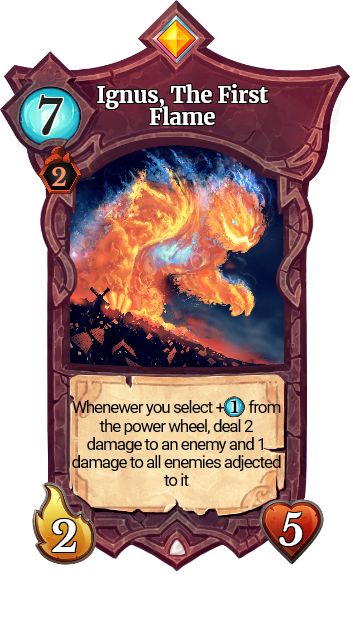 Now first of all, Flashstrike is a keyword ability that is commonly found in games with battle rulesets similar to Faeria (for example, First Strike in MTG). When attacking or defending, creatures with Flashstrike deal their damage before creatures without Flashstrike – which means that if the enemy creature dies from the damage, then the creature with Flashstrike will take no retaliation damage. I’ve chosen to make it limited to when attacking rather than both attack and defense, because it feels more balanced in this game. I think this fits the image of Sharra as a frail warrior relying on speed to destroy the enemy first. Her second ability activates when she enters play, allowing her to instantly attack an enemy in range. The attack follows all combat rules. However when used in combination with Flashstrike and a smart land placement, this can be very effective. The second part of her ability is more of a niche / lore element. If the opponent has a Dragon in play (namely Garudan, Tethra, Orosei or Azarai), instead of her on-play attack, Sharra can choose to deal 6 damage to that Dragon wherever it is, essentially killing it unless it has been buffed. With these changes I feel Sharra would be more useful overall in both offense and defense, being able to preemptively dispose of a large threat and have an immediate impact on the board. On the other hand she has no defense, so while she can be a great tempo swing, she cannot exactly establish board control unaided. This reply was modified 2 years, 3 months ago by Nightmayre. Yak attak is a funny card, but it can be really more funny, with individual card skin on every yak ! Anyway, here were my submissions and what I wrote! Oh man! I have so many ideas for this New Year’s Competition! It’s hard to just choose one… There were mainly two that I was choosing between, Architect and Master Swordsman. I ended up choosing Architect because I think currently Master Swordsman gets more action than Architect does. Also, the Architect I’ve made has more interaction and possibilities than Master Swordsman with other cards and from all colors, making deck creation possibilities that much higher, and making it that much more fun. That being said, I made 5 versions of Architect. I really believe there are so many potentials for it! But, I ended up going with my 5th version, and here it is! Architect Version 5. Making structure decks a little more viable. And easier to splash in structures too. I think this version is better than Version 1, although it’s almost the same. I think maybe having two gifts in one is maybe difficult and annoying. First comes one gift, then the other immediately. Might be messy since they are both choice. SO, I thought Last Words might be a better way to go. This, however, does add one complication, it would be the first card to make a “reaction” meaning you would have to make a decision during the opponent’s turn. For that to happen, I’d recommend it automatically stops the opponent’s timer and ability to do anything, and give 8 seconds for you to choose which structure. This should be enough time I think because players should be thinking about already which one they would buff if it died. If the time elapses without choosing, the opportunity is gone. You can also choose to not give extra life by not clicking on anything, ending the timer sooner. And obviously, no pausing or reaction would happen if there were no structures on the board.